Here at Mirik and Yarik’s channel for children, learning begins while your kids are having fun watching a selection of pretend play videos, outdoor play time videos, plus other fun videos for boys and girls. Watch these kids playing videos and play time videos for boys to see brotherly love even if they don’t get along all the time. The stars of this channel are the brothers, Mirik and Yarik, who go through fun play times together. Whether the kids play outdoors, indoors or at a playground, their video for kids show lots of fun moments that they share together. 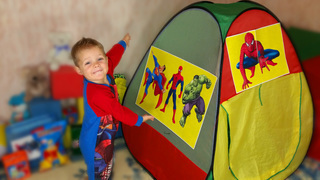 Watch all of their pretend play, kids play adventures, indoor and outdoor play time, plus unboxing episodes for free online here at Kivitu.com. Have fun going through all their episodes and repeat your kid’s favorite episode as much as they want. Their funny pretend play episodes at Kivitu will help spark your kids’ imagination while the kid playing videos provide happiness to your children while they learn. These videos are what you get when mix play for kids and simple lessons about numbers, colors or letters. With these, it is much easier for kid viewers to learn. Play one fun video for kids and see the smile in your child’s face grow as they watch an episode. Get ideas for pretend play and other fun things that you can also do together with your children. The video for boys you will find in their channel will also be loved by girls. After watching their video for boys and girls, browse through other channels found here at Kivitu.com to find other kid blogger videos that help your kids learn while having fun.